The much anticipated TECNO mobile flagship phone, Tecno Phantom 6 and Phantom 6 Plus are now official. The launch which coincided with TECNO celebrating its tenth anniversary was done on an international scene, at one of the most beautiful locations in the world, the prestigious Armani Hotel located in Burj Khalifa, Dubai, on the 25th of September 2016. September is indeed a month to remember. Apple was on the center stage early this month on the release of new smartphones, Google’s pure Android-based smartphones – Pixel and Pixel XL – are warming up for next week, but now it’s TECNO’s turn. 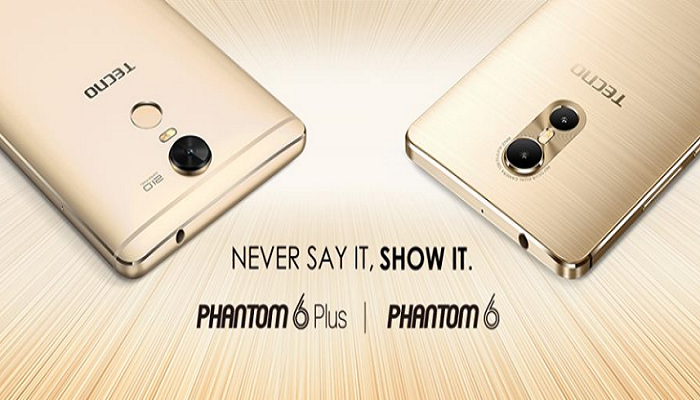 Been powered with the best features out there, the latest addition to the Tecno Phantom series is. without a doubt, going to be the best Tecno phone yet – the successful selfie #C9ja Tecno Camon C9 and the upcoming Camon C9 pro are in for a show. After launching the ‘smartphone of the year’ Tecno Phantom 5 in Nigeria, which served as 2015 Tecno Flagship Phone, The Chinese company is looking at repeating history by launching an upgraded version of Phantom 5, as 2016 Flagship Smartphone. This is not the first time they are trying to outwit themselves. Recall Tecno L8 that was popular for its massive 5050mAh battery, it’s successor, Tecno L8 Plus, released, later on, came with same battery specs but a bigger RAM size. Same this applies the Camon portfolio- from Tecno Camon C9, C8, C7, all the way to C5. The new Phantom 6 wears an ultra slim design with premium chamfered edges, spotting the TECNO brand’s first dual rear camera technology- a high definition combination of 13-megapixel fixed focus and 5-megapixel autofocus cameras with LED flash. Taunted by some analysts as the slimmest smartphone with dual rear cameras, the Phantom 6 stomachs an expanded internal storage space – powered by 3GB RAM for smoother operations with 32GB ROM leg room, expandable to 128GB. TECNO Phantom 6 enjoys improved processor speed at 2.0GHz, MediaTek’sHelio P10 chipset. “The TECNO Phantom 6 gives mobile consumers better stability, speed and possibly the best camera experience on a mobile phone,” says Mr. Attai Oguche, TECNO Deputy Marketing Lead, Nigeria. Also unveiled at the launch was the TECNO Phantom 6 Plus, the mobile maker’s latest phablet targeted particularly at the Middle-East mobile consumers. TECNO Phantom 6 Plus flaunts an impressive 6.0-inch IPS touch display and hosts the mobile brand’s first tri-fold security combination (fingerprint, eye scanner, and Trustlook antivirus). TECNO Phantom 6 Plus also boasts the latest MediaTek Helio X20 Deca-core chipset, making the super-smartphone one of the fastest mobile phones in the market. There were more than 80 local and international media present at the launch to witness the growth of TECNO Telecoms. Among the prominent international media, the Al Khaleej, Emirates News – Dubai, One TV, the Gulf News, Deutsche Presse-Agentur DPA (German News Agency) and Xinhua News Agency – Dubai Bureau, broadcasted the international product launch live. Other notable guests at the event included Kimura Makoto, General Manager of SONY; Jeremy Doutte, CEO of Jumia; Arthur Wang, Senior Director Corporate Sales International of MediaTek; Martin Kariithi, Manager Android Partnerships for Google (West Africa) and other business partners of TECNO Telecoms. Interestingly also, popular TV personalities Mercy Aigbe and VJ Adams were also present at the event. In the last decade, the mobile phone penetration rate in Africa has risen from 6% to 80% and TECNO Mobile being a major driver of this development is already servicing over 35 African countries while currently retaining the largest market share of 41.1% and 31.1% in Tanzania and Nigeria respectively. Mr. Vane Ni, Deputy General Manager and Global marketing lead at TECNO Mobile said, “we are proud of what we have been able to achieve in Africa so far and we are confident that the time is right for us to duplicate the same success across other emerging markets. When we arrived Africa 10 years ago, very few people would have thought that we would grow so fast to control the largest market share of 25.3% across six major African markets – Kenya, Nigeria, Ghana, Tanzania, Cameroon, and Ethiopia”.